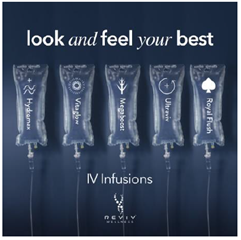 The unique concept of Reviv Wellness is one quite like no other, a range of booster shots and IV Drips designed to combat the stresses caused from day to day life. Originally established by four leading doctors, the brand now boasts outposts across the world as well as an impressive 28 locations spread across the UK. The simple yet effective treatments administer a range of vitamins, fluids and wellness agents directly into the bloodstream. Almost twice as effective as taking vitamins orally, the range available in the flagship salons covers everything from fatigue to youthful looking skin. Clients are left feeling regenerated and revitalised and boosters can be done in as little as 10 seconds for an instant pick me up on the go with the IV Hydration treatments taking around half hour. Tailored to suit different causes of dehydration such as alcohol intake and sun exposure, Reviv Wellness has created a new benchmark in aesthetic treatments. IV treatments range from the HydroMax aimed at sportsmen to the Megaboost which is infused with anti-ageing glutathione to detoxify and cleanse the body from within. One of the more recent drips available (and my personal favourite) is the Vitaglow, a ground-breaking treatment loaded with anti-oxidants to improve the skin’s elasticity and texture. Reviv’s booster shots are a fantastic way to keep the body on top form either in between hydration treatments or on their own. Lasting up to 5 days, the boosters promote energy levels and can provide a barrier to the immune system against the exhaustion and challenges of sports and a busy lifestyle. Reviv Wellness has three flagship salons in London, Cheshire and Leeds, consultations are always advised prior to any treatment to create a bespoke program that can be continued over a course. Prices from £29 for Booster Shots and from £99 for IV Drips.